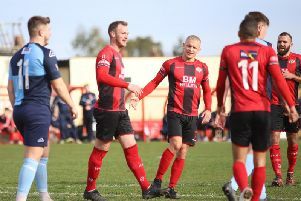 Marcus Law described the support his Kettering Town team he received at Stourbridge last weekend as “the best I have seen” during his two stints at the club. The manager had a previous spell in charge of the Poppies in the 2010-11 campaign before returning to lead them into Step 3 in 2015. Now into the fourth season of his second stint at the club, Law’s team look to be on course for automatic promotion after their dramatic 2-1 success at Stourbridge saw them move back to the top of the Evo-Stik League Premier Division Central. Kettering are two points clear with two games in hand on the Glassboys in what looks like being a two-horse race for top spot. The Poppies return to Latimer Park to take on Needham Market tomorrow (Saturday) and Law is hoping the fans will be out in force to raise the roof, just like they did in the West Midlands last weekend. “I think that anyone who had forgotten how big Kettering are would have got a good reminder of it last weekend,” Law said. “The number of fans we had at Stourbridge was superb, every other person I saw was in Kettering colours and you could real feel the atmosphere they were creating. “I first came to the club when the troubles were beginning to show but I remember the day we played against Rushden & Diamonds at Nene Park and I saw what the fanbase was capable of that day. “As far as away matches go, last weekend at Stourbridge was the best I have seen and now we want them all to come to Burton Latimer and do it for us there. “The fans make a massive impression on the game, it’s something the players have mentioned. “If we can get more coming in at home and as many as possible at our away matches then they can really help push us on. “We want to make this a journey to remember but there is still so much work to do. “Every game will have its own pressures and that is what comes with chasing a title. Law, meanwhile, is hopeful that at least one of the Poppies’ trio of injured players will be back for tomorrow's clash. The win at Stourbridge was made all the more impressive with Kettering being without the suspended Rhys Hoenes and full-back Dion Kelly-Evans who was ruled out due to a slight hamstring problem. And Law was also forced into a reshuffle during the game as well with striker Aaron O’Connor being withdrawn during the first half while centre-half Declan Towers was forced off at half-time due to a knee problem. The Poppies boss added: “We will have Rhys available again as it was a one-match ban. “And I think Dion is closer than the other two. He could have had a fitness test on Saturday but he felt it a little bit. I think the week’s rest will ensure he is contention for this weekend. “With Aaron it was more of a dead leg and I would think we are probably looking at 10 days for him. “We knew Declan probably wouldn’t last the whole game but he has been an important player for us so we wanted to give it a go.